Do you live up Morningside way? Do you have an interest in this sort of stuff? You seem pretty good on it I've noticed. It was the original post that got me interested. PictureThis Scotland twitter feed is good to follow. Never knew there was a East Pilton railway station and that has led on here to finding out of all the other surburban disused stations. More than what I thought ! See the 1959 picture you sent me? I recognise it but just can't put my finger on where it is? 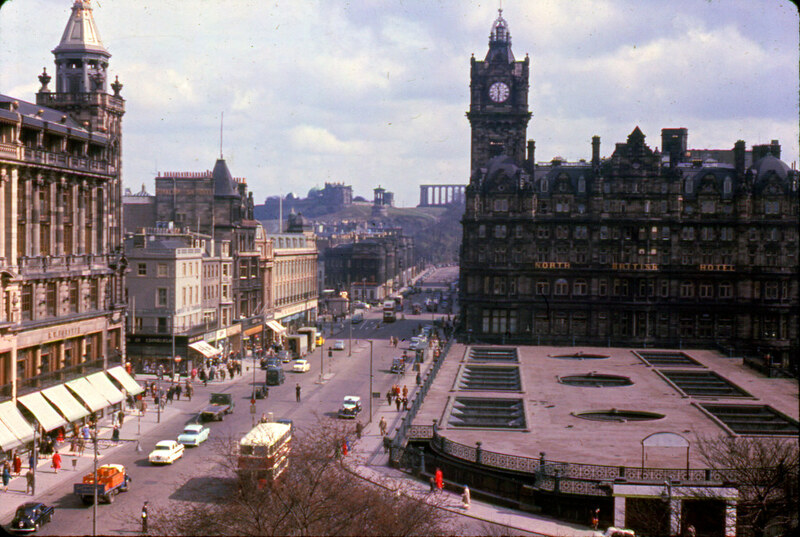 Top of Lothian road looking down towards Princes street. FS so it is! Duh! Woolies just behind that bus turning the corner. And I can almost see Andersons bar and the Burnt Post! Hanging Bat, Moriartys and Poundland now I think. Just showed the picture to my wife and she didn't get it either. What was throwing her was the pillars on the left above what is now a tanning shop and a football shop. If we'd looked further down we would have got it from the St. Cuthberts church steeple. I had a problem with it also, with the immediate discussion having been Morningside I allowed myself to try and put the location there, after a while I thought this is familiar I should know it and it came back. Yeah, we were over in January and April. We went to get the 35 from Fountainbridge to the airport and found out it didn’t exist now! Think it was a number 300 we had to take. I was talking about the turn ! Got you now! Sorry, misunderstood your post. Just re-read it and see what you were saying. We got there too Bob. I didn't recognise it either, and in 1959 I was working in Fountainbridge, right around the corner!! You might have had a few glasses of the old moose milk since then though ! Thank God Ron! Thought I/we were going mad. More than a few, if the truth be told. Get in there Ron, you only live once. Brilliant pics guys/girls. The Lothian Road one was before my time but l was struggling to think where it was. It's unrecognisable now from back then. Really interesting seeing these old pics esp the railway stations! Looks like someone waving a Hearts flag from that tram unless it's just wishful thinking on my behalf! Is it true that the trams used to run on mechanical cables? I think somewhere near the East End of Princes Street there is evidence of where the cables were 'powered' but perhaps lm wrong?Anyone else know what this is or am l just mistaken? Isn't there a cable visible above this tram? A quick check suggests you are indeed correct. 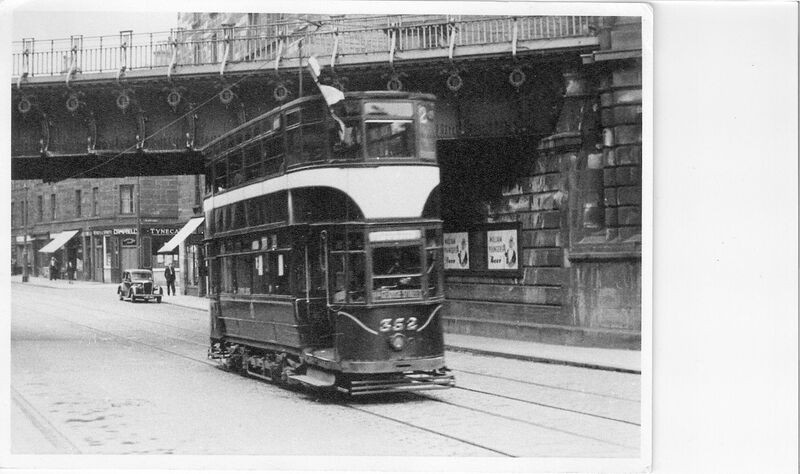 The original trams were horse drawn before guides were laid and they were then pulled by cables. My mother was a conductress on the old cable cars, I am not sure of the time factor, if it was when she came back from England after the war, or when she lost her job as a nannie to an army officers family at Piershill Barracks, they were going to India and wanted her to go with them, but she declined. Hopefully we will share a moose juice together. That's a policeman directing traffic in the middle of the road in the second picture - imagine how long he'd last now! 2 seconds ! Bet they loved it when traffic lights were fitted. Roughly when were these MS? Thanks, that’s what I would probably have guessed. Some very striking things l picked up from these photos apart from the parked cars - the street is immaculately clean and there are no potholes, there is next to no street furniture cluttering the place up, there are hardly any tourists (as far as l can tell) and it looks quiet (although that could be just the time of day that the photo was taken). Loving the old school lamp posts, the old style buses and the fact the central reservation doesn't run all the way along! It was 11:15 in the morning for the bottom picture. Wouldn't be like that at 11:15 nowadays though the shops side looks busy. If I was a billionaire, Id buy the Balmoral, and change the name back to "North British"
The 2CV looks quite modern there I think. Before the modern Waverley Market (is that what its called?) was built, and after whatever this thing in front of the North British was knocked down (was it an actual real market? ), I am sure I remember my mum parking in a carpark in the gap site in the 1970s when we went shopping up town. Does anyone else remember the carpark, or am I completely making it up? instead we have councillors looking at their navels ! I was just going to post that I mind my dad parking on Princes Street when I was wee in the early/mid 70s and if we couldnt get parked there, we would park in a "car park" in what is now the Waverley shopping centre. One year we went into the New Year sales (when they started on New Years day, before all the big hogmannay party pish) and we got parked outside Boots. Princes Street looks so much better in these photos than it does now. Gladstone Monument on St Andrews Square.